Recently I’ve seen a lot of new versions of the classic board game Monopoly. There’s the new World Edition, and Streets Edition with new 3D buildings, and even ones you can play on games consoles. I’ve seen tons of variations with different themed sets like The Simpsons & Star Wars, Disney, even a new one that uses an electronic gadget and credit card styles payments. I’m pretty sure I’ve seen a blank Monopoly board where you can draw in your own designs, which is pretty cool. I haven’t played Monopoly for a few years, we have the deluxe edition stashed away somewhere too. I’m eager to dig it out and give it a play soon! This post is about my own version: Monopoly Zombie Edition. I came across a hi-res image of Monopoly: Here & Now World Edition and because it looked very different I wondered if I could recreate my own board. So using Photoshop & Fireworks I set about building my own design. It has taken some time, and a lot of messing about with themes and layouts etc but it has also been very rewarding and great fun. I’ve always loved graphic design, in the past I’ve designed catalogues, brochures, business cards, websites etc, and even though I don’t earn money from that anymore I still enjoy the design process. I used images freely available online. They were reduced in size, cut, pasted, enhanced etc. I’ve kept Community Chest and Chance but changed the images. Also the stations are now graveyards, the utility companies are now Zombie Movie Studio and Scary Movie Cinemas. Below you will see the complete board. Click it to view the hi-res version – it’s a big image and large file size too, but it looks sooo good! As yet I haven’t given much thought to all the extras – money, property cards, game pieces, hotels etc. I guess the money could be the same, but the Chance and Community Chest cards would be zombie related to fit in with the theme. The game pieces could be bones or skulls maybe, something related to zombie movies. I enjoyed making this so much I’m going to do a few more. As I’m a World of Warcraft fan I’ll work on a theme based around the world of Azeroth next. If anyone is interested I can post the .PNG file (Abode Fireworks file format) of the board I made so they can download it and build their own. It took some time to get the layout right but now it’s just a case of making alterations to the design. The only thing I’m not too sure about are the Paris and Hollywood places – at one point I was running out of good quality images with zombies in them. I considered using zombie movies posters but that would make it more a movie theme than pure zombie. There are an unlimited amount of editions to make when you think about it, although the tricky part is finding images to fit the theme you want. I also wonder what this would look like when printed out at the right board game size. A standard home printer probably wouldn’t be able to do it so I’d have to take the file to a printers. Maybe, just maybe I’ll think about that at some point. For the time being I’m happy to say this has been a labour of love, I’m really proud of this. and I’m excited about created a new one! EDIT: 25th Feb 2011. Below is the .PNG version of the board. This was created in Fireworks. Click it to see the full size – 11.4mb. 2000 by 2000 pixels. Editable .PNG version of the board. Click to view full size. NEW World of Warcraft Monopoly! Interesting design. I was looking for a Zombie version of Monopoly several months back and couldn’t find one. Like you, I decided to make my own. Tonight, as I was retouching up the board before I get it printed this week, I just happened on your site tonight randomly. All custom made cards, property cards and money have been printed. Game pieces are a combo of modified originals and totally new figures I purchased at a local hobby shop of characters using guns. Hi Caleb. I’ve uploaded the editable .PNG version. It’s 11.4mb in file size and 2000 by 2000 pixels. Hope this isn’t for a class of young kids! do you have chance cards and such made already? would love to have this complete set! great work! Thanks! Yes I do have Chance and Community Chest cards, and Property Deed cards, also a full set of Monopoly WoW money, just look under the Warcraft Category. what types of things did you write on the community chest and chance cards? I designed a set but can’t seem to find them now. I copied them to a portable hard drive. I’ll have to look around for it. I honestly can’t remember what I wrote on them. I’m tempted to make some more now in fact. Hi Dave, all I can say is WOW! You did an excellent job! I found the world of war board and pieces but I was wondering if you did the ZOMBIE edition of money, community and chance cards. The world of wars stuff is amazing but it really doesnt match the ZOMBIE design. I also found you on devianART! Just Awesome! Awesome! Where can I buy a copy of the game? It’s a sad thing to say but the makers of Monopoly don’t accept amateur designs. If I wanted to get it made into a proper game I’d have to get a toy agent and go through a very long process. So I guess it’s just something fun to look at for now. Dude where do I but this?! Sadly you can’t. 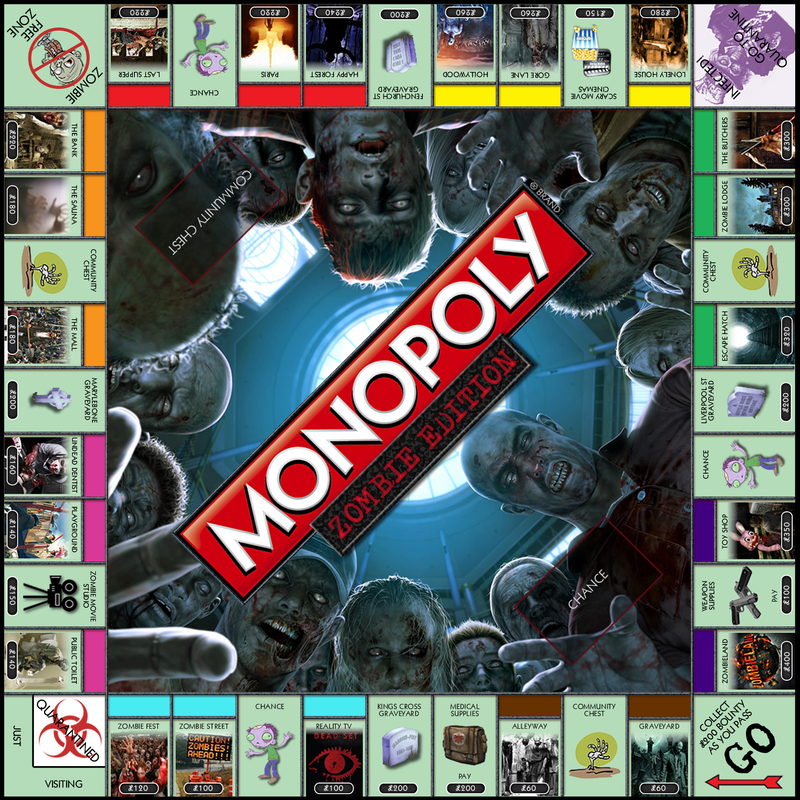 I’ve not seen any zombie themed monopoly in shops or for sale on line. I created this design myself just for the hell of it. Would be awesome if you could buy it though! I was wondering if you already have the chance and community cards and money for this kind…that would be totally awesome…especially if you could show it.. I did design some but they were lost when I didn’t back up my hard drive and it crashed on me. If I get time I’ll make some more soon and post them. 5. As suddenly as they had appeared, the road ahead was clear. that depict the grotesque lawlessness and selfishness of humankind.